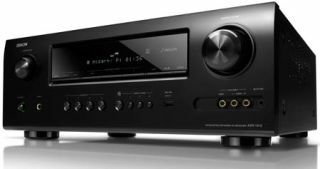 Denon launches 2011 AV receivers complete with Apple AirPlay | What Hi-Fi? Denon has announced its AV receiver line-up for 2011. The five-strong model range includes the first three machines to feature integrated Apple Airplay. The receivers are due out from this month and all five support 3D pass-through, as is now standard across Denon's range. The entry-level AVR-1312 (£250) features 5 x 110w channels, four HDMI inputs and one output and support for HD audio. Step up to the AVR-1612 (£380) for a front USB port for connecting an iPod/iPhone, increased power to 120w per channe and Dynamic Volume audio processing. Debuting on the the AVR-1612 is Denon's new Setup Wizard, alongside advanced Audyssey MultEQ calibration. The AVR-1912 (£500), AVR-2312 (£800) and AVR-3312 (TBC) all feature integrated Apple Airplay and 3D support, and promise to major on network capabilities and ease of use. Airplay allows you to stream music directly from an iPhone or iPod Touch as well as directly from your iTunes library on a Mac or PC. There's a USB for direct playback, too. The receivers also support DLNA, allowing streaming of MP3, WMA, AAC, FLAC and FLAC-HD audio, plus photos, from a PC or NAS device. Over 12,000 internet radio stations can also be accessed, as well as subscription-based music services such as Napster and Last.fm. The AVR-1912 offers six HDMI (1.4 with 3D and ARC) inputs and one output, seven channels of 125w, Audyssey MultEQ, Dynamic Volume and 2-zone capability. Pay the extra for the AVR-2312 for a 7.2-channel receiver, 135w per channel, an extra HDMI input and Audyssey MultEQ Pro. Meanwhile the top-of-the-range AVR-3312 bolsters its specification with 165w per channel, a second HDMI output and front height and front wide connections. You'll also find Audyssey DSX Processing, Dynamic Discrete Surround Circuit. AL24 Processing, Clock Jitter Reducer and 3 source/3 zone capability. The entry-level AVR-1312 and AVR-1612 are due out this month, to be followed in June by the AVR-1912 and AVR-2312. The AVR-3312 will follow later in the year.